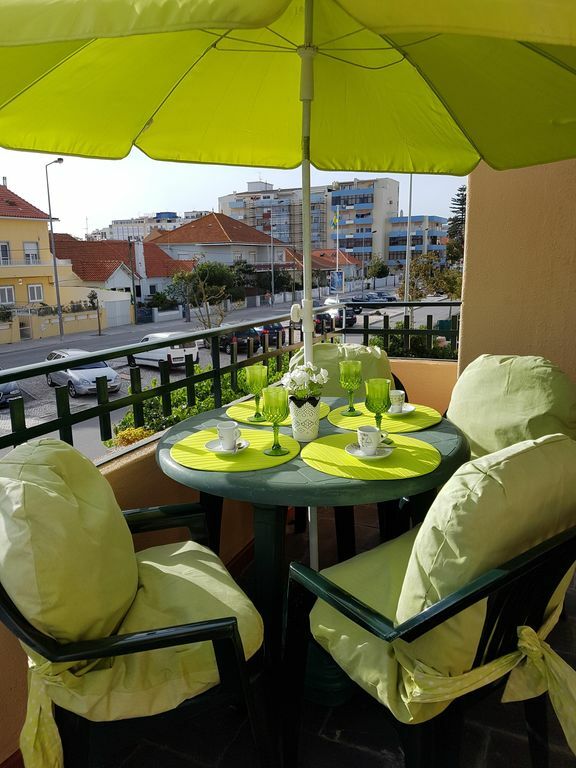 The house is situated on the main avenue of Costa da Caparica, next to the city center, about 200m from the beach and next to the bus station that connects the city of Lisbon in 20 minutes. Is the next golf courses Aldeia dos Capuchos. With its west facing balcony with space for outside seating. It has two bedrooms, a living room, kitchen and toilet. Offers bedding and toilet, dining wares and kitchen utensils. Friendly owners, good location but improvements needed. Apartment has potential to be very nice and the owner Helena was very friendly however I felt the apartment could have been cleaner, utensils in the kitchen were dirty and thick with grease, I basically had to clean the whole kitchen before using it and the beds in the twin room are horrible, rock hard, like sleeping on a rock hard floor. Location of the apartment is good, everything with walking distance. Like I said owners great and apartment has great potential but unfortunately the standard of cleaning was poor and the beds were the worse beds I have ever experience and after a long day exploring the city you need a good nights sleep which was impossible in their beds. We thank your comment because the return of our guests helps to improve our welcoming. We are very surprised because this is the very first time that a guest is complaining about the beds as well about the kitchen cleaning. We are going to try to improve and to be more attentive about the cleaning. Apartment very clean and very good location.The owner Helena Bras is very frendly and provide good customer service.I recommend this property for holiday.Many thanks for fantastic holiday. As our previous stay, everything was perfect! You really cannot ask for better owners. Helena and Carlos are two of the nicest people you will meet and very helpful. We stayed with another couple (so there were 4 of us), once again for a month. The apartment is just as described and pictured, it is very comfortable. The location is perfect, walk to the beach and town. It has everything you need right at your finger tips. I really can't say enough nice things about it. We stayed in this beautiful, clean and well-appointed apartment for the whole month of September. The apartment is very well situated and a very short walk to the beach and all of the little restaurants and cafes that line the beach. You can walk to shopping, restaurants, groceries and such in town. If you want to go into Lisbon you can take a short ferry ride. The ride in itself is beautiful with spectacular views of Lisbon. Lisbon has something for everyone and is a beautiful city. We were 2 couples staying here for the month and it was very comfortable. We enjoyed our coffee on the terrace every morning, having your own little outdoor space really makes a difference. The apartment has everything you need and it’s a great value. Perfect for everyone! Carlos and Lena were extremely friendly and helpful. We are looking forward to our return! Das Apartment war sehr sauber. Die Vermieterin hat sich sehr gekümmert. Die Wohnung liegt an einer viel befahrenen Straße und die Fenster sind nicht gerade Schalldicht!